Breaking barriers: Two Dalit widow priestesses perform pooja at Kudroli! 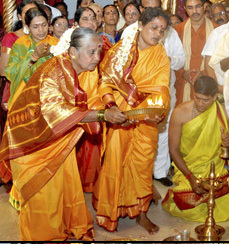 In a move to put an end to the practice of caste and gender inequality in temples. two Dalit widows are appointed priests at a temple in south-west India, in a rare move for a country where caste prejudice is still rife. This took place in Mangalore, Karnataka State, at Kudroli Gokarnanatheshwara temple, which has witnessed the onset of several new traditions. Dalits, once known as ‘untouchables’ and ‘Harijans’, and still very widely discriminated against with extreme prejudice in most of India, are a so-called ‘scheduled caste’. That women, which gender suffers huge inequalities in India, take on what is traditionally an entirely male preserve is also progressive. Further, widows were until recently universally treated by most of Indian society as virtual non-persons who had to drag out their lives in penurious and hopeless conditions. While India already has far too many priests, gurus, countless wandering sadhus and ‘holy men and women’ – it is at least positive that this position is no longer the total preserve of males or higher castes. India’s whole caste system should be abolished According to a survey made some time ago by the International Movement Against All Forms of Discrimination and Racism (IMADR), in India, on an average two dalits are assaulted every hour, three dalit women are raped every day, two dalits are murdered and two dalit houses burnt down everyday. Sathya Sai Baba fully defended India’s unjust caste system THE CASTE SYSTEM OF INDIA – SATHYA SAI BABA, GANDHI, AMBEDKAR One of Sathya Sai Baba’s most bandied aphorisms stated: “There’s one caste, the caste of humanity“. That is fine, but why therefore does he support the Indian caste system? This entry was posted on October 6, 2014 at 10:13 am	and is filed under Sathya Sai Baba. You can follow any responses to this entry through the RSS 2.0 feed. You can leave a response, or trackback from your own site.